What, exactly, is a scribe? We ought to be curious about this question, as we have no fewer than 8 instances in the New Testament of Christ pronouncing woes upon the scribes, along with their pals the Pharisees—though the term “scribe” curiously doesn’t appear even once in the Book of Mormon. In ancient Judaism, the scribes were a class of highly trained and respected professionals, whose duties included reading, copying, and interpreting the scriptures. Scriptural questions, when they arose, were settled by an appeal to the scribes, who had devoted a lifetime to study. In short, the scribes were the equivalent of professional gospel scholars today. Also referred to as “doctors,” some of these were the men who discussed scripture in the temple for three days with the 12-year-old Jesus, and found themselves “astonished at his understanding and answers.” (Luke 2:47) Despite their lifetime of professional training, this 12-year-old boy had greater understanding than did the scribes. Christ therefore knew exactly what ideas he condemned when he pronounced woes upon the Scribes for what they taught. Our Lord’s understanding of God’s word reckoned from a different place than the scribes’ understanding. And so there you have it, from one who, by age 14, knew God face to face. The best way to gain the Lord’s word is from the Lord himself. It really does, in the end, come back to James 1:5. Seeking to understand God in any other way is to, in some degree, deny the spirit of prophecy and revelation (see Helaman 4:12, 2 Nephi 28:4). True prophets do not rely on scholars. But at times when there are no prophets, and questions must still be answered, the first inclination is to turn to the scholars or scribes. Christ himself was born at a time when prophecy had ceased among the Israelites. Yet the Pharisees, zealous in their religious devotion, still sought guidance on every bit of minutia they could find in the law of Moses. So they turned to the scholarly scribes to settle questions and provide interpretations. The scholars, devoid of the spirit of prophecy, used their learning and study to establish doctrine, rules, and social order. 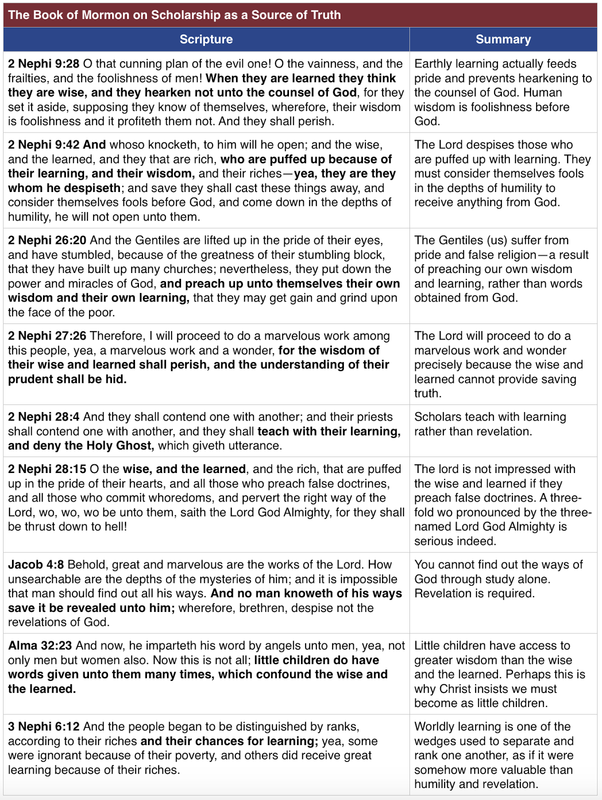 They “taught for doctrines the commandments of men.” This is always the pattern when prophecy ceases. King Herod, though the ruler of Judea, was totally unaware that the King of the Jews had been born right under his nose. 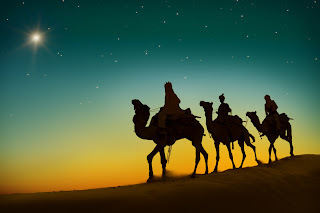 When the wise men made him aware, Herod still knew nothing about the event. So he consulted with the scholars, who also knew nothing about Christ’s birth. By consulting scripture, they came up with the right location of Bethlehem. But they still did not know the timing. 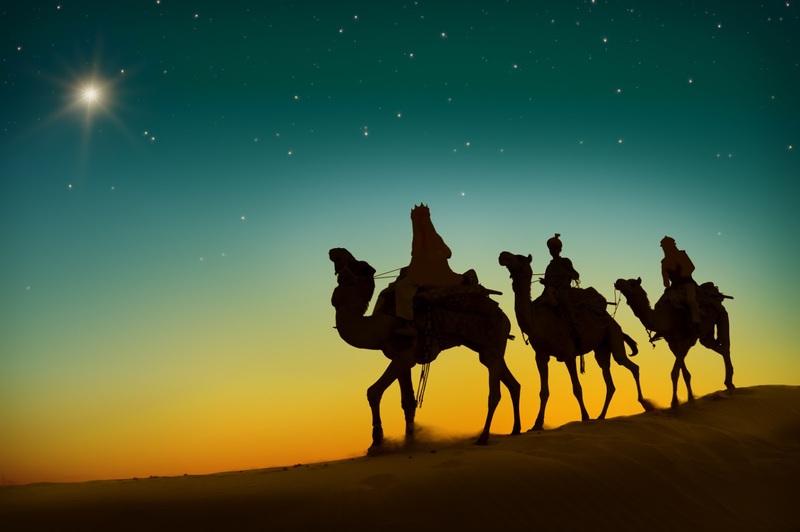 The prophets from the East, on the other hand, who had been watching the signs overhead, knew all about Christ’s birth, together with its timing and rough location, and traveled a great distance to be there. It was the prophets who worshipped the child, while the scholars stayed aloof. Scribes are scholars. They spend their time studying, and the more years spent in scholarship, the more they claim to know (2 Timothy 3:7). Their tools are study, debate, criticism and reason. Their degrees make them feel qualified to define truth for others. They publish their ideas to gain notoriety and professional standing. Their peers are responsible for evaluating their ideas for importance and truth. And their conclusions regularly change as debate continues, thus justifying their continuing employment. Such tools, useful as they may be, are ill-fitted to discovering the things of God. You simply will not find God in a book—not even a book of scripture. Even the greatest theologians in world history have never matched the achievements of fishermen and plowboys in piercing the veil and knowing God. And the greatest prophets in history likely had less formal education than a modern high school student—yet they knew God and his unchanging truths. God is known through experience, not education. Gospel scholars, with no actual experiences of their own, ALWAYS rely on the actual experiences and revelations of these uneducated men as a basis to make their educated, scholarly arguments. Rather than piercing the veil themselves, scholars endlessly debate the experiences of others who have done so. In the end, prophetic knowledge is not obtained merely by study, reason, and argument. Prophets have access to a higher source of truth. Notice that Elder Ballard doesn’t merely consult scholars, but stresses they are “trained” scholars with a “lifetime” of study to qualify them, thus lending weight and validity to their opinions. ADAM: I am looking for messengers. PREACHER: Good morning! [Looking out over the initiates.] A fine congregation! LUCIFER: Yes, they are a very good people. They are concerned about religion. Are you a preacher? PREACHER: Certainly! A man cannot preach unless he has been trained for the ministry. Lucifer then hires the minister to preach for pay, and the well-trained minister proceeds to teach all manner of falsehoods that Adam neither accepts nor even understands. Adam knew God, you see, and was uninterested in the opinions of the “trained” imposter who did not. Sadly, however, this entire vignette and the truth it conveys have been removed from the endowment, and few remember it. I was fortunate to be endowed in 1989, and saw this exchange first hand. Wise people do not rely on the Internet to diagnose and treat emotional, mental, and physical health challenges, especially life-threatening challenges. Instead, they seek out health experts, those trained and licensed by recognized medical and state boards. Even then, prudent people seek a second opinion. If that is the sensible course to take in finding answers for emotional, mental, and physical health issues, it is even more so when eternal life is at stake. When something has the potential to threaten our spiritual life, our most precious family relationships, and our membership in the kingdom, we should find thoughtful and faithful Church leaders to help us. And, if necessary, we should ask those with appropriate academic training, experience, and expertise for help. Brother Turley then proceeded to preach, for hire, a mixture of truth and falsehood, as in the temple vignette above. Perhaps most tragic point of all this is that LDS scholarship, though heavily relied upon, has intentionally been curtailed and limited. You may have heard about the excommunication of the September Six back in 1993, or the ensuing debates about academic freedom at BYU. But you may not know that BYU—the “Lord’s University” and source of most LDS scholarship—for all intents and purposes, prohibits any research on the Book of Mormon as an ancient document. It’s death to the career of any academic foolish enough to engage in it. The Book of Mormon is only to be treated as a 19th-century creation in any serious scholarly work. The only Book of Mormon classes offered now are introductory level 121 and 122 courses. FARMS has been dissolved. And the university most uniquely situated to promote the Book of Mormon treats it as an embarrassment and a distraction, pulling in “teachers” from practically every unrelated department to teach it in entry-level courses. Keep in mind, this is the well from which the church draws its “trained scholars” to answer doctrinal questions the apostles can’t answer themselves. And just who trains the “trained scholars?” Well, the prior generation of scholars, of course. Thus the traditional indoctrination is preserved, inaccuracies and untruths are defended and perpetuated, and the mighty ship steers straight toward the rocks, mistaking the lighthouse for an opposing ship, arrogantly refusing to alter course. Saving truth comes from God, not scholars. Even the most basic testimony only comes by revelation. Scholarship and study alone have never, ever, not once in history, produced adequate light to bring a soul to salvation. If you lack wisdom, ask of God, and for heaven’s sake, don’t use Christ’s name to teach what some “trained scholar” claims is true. There is one source of truth. Commune with God. Of course scripture study is important, when properly undertaken. In the next installment, we’ll talk about scripture and scripture study. You have just broken my heart, and thrust me into the depths of sorrow (and humility). As a lifelong LDS whose roots go back to when Joseph Smith baptized my ancestors in the Mississippi river at Nauvoo, I must admit that this post has cut me to the bone. Thank you for helping me to understand why the dearth of revelations from the leadership in today's LDS church. Wish it weren't so; but I will grieve a bit and then continue to unlearn so much of what I assumed was pure doctrine. God bless you, Linda. It took me a little while to realize what you're describing was actually a good process. Hard to see now, but shaking off the traditions that bind us is designed to connect us better to Christ. Upward and onward. I understand your remorse. Two years ago, I had the same kind of wake up call. It was painful. The process of re-learning and the shedding of tradition has been exciting, although I have moments of discomfort. There are times when I weep and long to be back in the comfort zone of naivete and trustfulness. One does not have to take full responsibility to study scripture, pray continually, and seek in depth understanding through personal revelation in ALL things when depending upon the many voices of confused messengers. However, there is something wonderful about cutting the “Dependency Umbilical Cord” from Salt Lake. To read the scriptures, for what they truly say, with new eyes, shedding the milk toast “Correlation” interpretation we get in our meetings has been exciting. For me, the gospel has unfolded in a new way, and I love it. Thanks for revealing this pattern in scriptures to me. It's a fact. I'm not sure what else could remove all doubt about the 15 after reading this article? But hey, as Brad Paisley sings "I've said that before!" True messengers do what they do because of the love of God in their hearts, although they're falsely accused of other motives. I pray for us all. I feel that part of this faith abandonment can be attributed to the Church’s teaching of a binary mind set such as - if the Book or Mormon is true, then the Church has to be true. If a person learns things which cause them to question the validity of our “Prophets”, “Seers” and “Revelators”, then they throw the Book of Mormon out also. If the Church isn’t true concerning (name your issue) then the Book on Mormon isn’t true either. This mindset leaves the member without the moorings of the Book of Mormon and a resentment towards the Church and its teachings. “Today, the Church disavows the theories advanced in the past that black skin is a sign of divine disfavor or curse, or that it reflects unrighteous actions in a premortal life; that mixed-race marriages are a sin; or that blacks or people of any other race or ethnicity are inferior in any way to anyone else. Contrast Ammon’s definition of a Seer – “to know of things which are past” to the recent talk given to the CES educators by Elder Ballard. Here Elder Ballard reinforces his reliance on trained scholars for answers to historical questions rather then his “Seership”. In the Church’s binary mind set, they fail to see that the Book on Mormon can be true whether the Church is true or not. 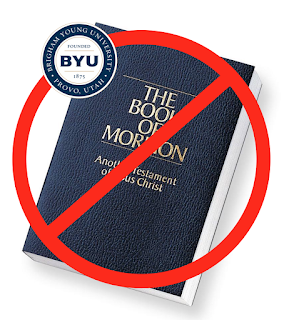 The truths of the Book of Mormon are independent and it can stand on its own. In fact it contains prophesies that the Church will fail and come to an end. The only church that will exist in the Millennium will be the Church of the Lamb with Christ as its head. Truth can always stand alone, independent of man or institution; it is our job to seek it, recognize it, and then to embrace it. It's a useful exercise to go through each line/word that was edited and to make a conclusion of what the Brethren wanted members to take away from the "correction" they made. Clearly the objective was to blur the distinction between gospel and church institution. Elder Poelman's message may have been inspired by George W. Pace's book, "What It Means to Know Christ" (published 1981). He said on page 14, "I don't think it can be said too strongly that redemption is not in the principles, ordinances, or programs of the Church but rather in Christ. The ordinances and the principles and the programs of the Church are channels by which that power can flow into our lives if, again, we truly exercise faith in Christ." This book earned Brother Pace two public rebukes by Elder McConkie and a simultaneous release as stake president for daring to teach that we should strive to personally 'know' Jesus Christ. Reading your posts reminds me of a seriously cool object lesson I saw once, Adrian. The teacher held up what looked like a 12-inch sheet of black plastic in a cardboard frame. The sheet of plastic actually turned out to be two identical sheets of linear polarizing material with interesting properties. Like a pair of Venetian blinds held at right angles, when these sheets were positioned at right angles they blocked the light. As one of the sheets was rotated it became more and more aligned with its companion, allowing more and more light through. You’re inclined to set aside the tradition of holding the polarizers of the gospel at right angles and instead, rotate them so they let the light through. Thank you. Even having taught lessons that included 2 Nephi 9:42 myself, the combined weight of your table of evidences from the Book of Mormon showing that the Lord isn’t impressed by our learning and wisdom nor it is sufficient to bring us salvation—is a revelation. After all the lessons and conference talks quoting General Authorities where we are counseled to follow them carefully to salvation, we appear to have chosen the more reasonable, but much less useful path. We’re like Lehi in his vision of the Tree of Life, following that nice man in white robes for hours through the mists of darkness. That guy leads nowhere. He probably reassures Lehi to be of good cheer because they’re just about there. He may offer Lehi a good deal on a copy of his best talks and sayings. It isn’t until Lehi finds the rod of iron symbolizing the word of God and the Word of God that the strait and narrow path to joy becomes apparent. And dang the mockers in that fancy building. This process is one in which we get to choose and pursue against the communal sensibilities of our own society. But it’s worth it. Seeking the Lord and receiving his light and knowledge leads inexorably to salvation. This has been one of your better articles. Very good job! Not all study is bad though. And I'm not saying your article is stating that at all. It isn't. Your article is pointing out that the trained scholars we have really don't have much depth. I would also let your readers know when that article first came out in September 2015, (the one you reference in the post), I immediately went to my Bishop and asked who these trained scholars were and how I could get into contact with them. He did not have any answers but tried to find some for me. When he came back, he told me he had called Church Headquarters (I guess anybody can call church HQ he had learned), he was told to suggest to me that I "read an article on LDS.org and or take an institute class!" I told him ahead of time, that was most likely going to be their response. I asked if I found a professor at BYU that could answer my questions, if it was OK to consult with them. He didn't see why not. I have not reached out to BYU yet as I fear now they may not have the answers I seek. All this did was have me turn further to Christ, where my loyalty and fidelity first and foremost remain. It did before I converted to this organization and it will be if I ever leave it (voluntarily or involuntarily). I'm not sorry for this fact and I'm very vocal about it at my ward. I don't consider myself a scholar but I know I study more than the majority of the people I get to interact with whether that is the Bible or the Book of Mormon. As a Technical Writer, reading the correlated materials the Church has published, produces the same feelings as hearing fingernails across a chalkboard. I have copies of each of the correlated materials currently in print at my house. Working in IT I know they can update anything on LDS.org and at a mouse click erase any previous teaching material they like with no record of what they taught before, giving the impression of showing "evergreen" content on the site. I like to have hard copies for comparisons. I'm just that way. I believe in upholding the truth. I only read the correlated materials now if I feel like punishing myself. It's mind boggling with the contradictions, the omissions, the inaccuracies, the butchered scriptures partially quoted and then quoted out of context along with some of the references in which when cross referenced, have nothing to do with what they say it does. Too stressful for me to continue trying to correct it all and getting shut down in class (Gospel Doctrine or Relief Society) when I try to bring it up. A faithful TBM boyfriend I had once says he is worried that I might apostatize from the organization. I kept trying to point out, I must have, know and practice the truth even if the leaders are wrong. I would much rather apostatize from an organization, full well knowing I would never apostatize from Christ or HIS words. I would rather be a member of the Church of the Firstborn any day rather to remain a member of the Church of Jesus Christ of Latter-day Saints as we know it today. That thought for many Mormons here in the Salt Lake Valley is equal to blaspheme. The question is: How much longer do I "hang in there" with the organization before I just say too much at church one day? And why should I ever be worried about saying "too much" in a truly healthy relationship? Unfortunately for myself, I know the answers to these questions already. I appreciate all the hard work you put into your posts, Adrian. Keep up the good work. Outstanding thoughts, thanks. Do you have specific examples of changed, correlated doctrine? Thank you, always enlightening to read your posts. Ever since my wife and I have started on this path for the truth, the Book of Mormon has been opened up to us like never before. It is the word of God and will bring us to the Savior here and now. Seeking knowledge is not a bad thing. You sound like you condemn anyone who is a scholar...a scribe. Not all scribes are bad. Matt 23:34 says Christ will send scribes and wise men to his people. "Wherefore, behold, I send unto you prophets, and wise men, and scribes: and some of them ye shall kill and crucify; and some of them shall ye scourge in your synagogues, and persecute them from city to city." Sounds like good guys to me. Adrian, thank you for this post and for all of the links therein. I particularly liked the link to the Patheos article on BYU changing its education curriculum. I found this quote in the article that sums up how I feel about those changes. " (The rumor is, the Dean [of the BYU’s College of Religious Education] has decided to change the name of their department to “Ancient Prooftexters.” Note: the previous sentence is a joke.)" Thanks for all your work. I also got my endomwent before the big change and had totally forgotten the preacher dialogue and in fact that character entirely. I assumed the specifics had been deleted due to unfavorable references to the Catholic church and they were trying to be PC (where satan says "I will buy up armies and navies, popes and priests..."). Remembering this section of the endowment was a breath of fresh air. This article aside, even an unbiased reading of 2 Ne 28 Should be enough to convince anybody that all is not well in the church. How Many Aprils? How Many Fools?